Recognized by National Geographic Adventure as "The Best River & Sea Outfitter on Earth" based on education, sustainability, quality of service, spirit of adventure and references, O.A.R.S. 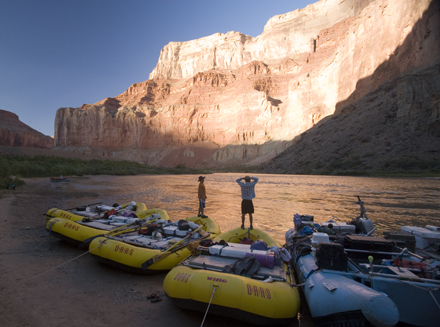 offers 1- to 14- day rafting, hiking & multi-sport trips in Utah's Canyonlands & Arches national parks, as well as in Dinosaur National Monument. Founder, George Wendt's infatuation with desert southwest river canyons is what led him to establish O.A.R.S. four decades ago. His early journeys on the Colorado River through Glen Canyon and Grand Canyon and on the Yampa River in Dinosaur National Monument captured his imagination, fed his inquisitive nature and instilled in him a desire to further explore, share, preserve and protect these picturesque canyons. In more than 40 years of leading adventures through canyon country, O.A.R.S. has successfully navigated the many details necessary for an unforgettable journey. We prepare soul-satisfying meals, apply band-aids on owies, offer a hand to help hikers over the next boulder, row flat-water against the wind while keeping up a conversation and share a scotch while watching a brilliant night sky. We offer the best guide to guest ratio (1:4) in the industry: we understand relationships are just as important as whitewater. Our guides are reliable, responsible and experienced. They're friendly, open and approachable, and they are there because they thrive on sharing their understanding of the natural world with you and your loved ones. They keep you calm as you may be taken way beyond your comfort levels. They get you through your adventure while making sure you don't miss the magic. They want to you to have the best vacation of your life.